New STEM Center at SLCC anticipated to receive about 10,000 visits per spring and fall semesters from students seeking free tutoring and advising and a space to work and collaborate. SLCC President Deneece G. Huftalin cuts a DNA 'ribbon' to open the new Dumke Center for STEM Learning. It’s going to bring all of us together so that we can push one another to achieve our dreams, to achieve happiness and to keep on pursuing the help that our families need. Salt Lake Community College opened the doors Wednesday to its new Dumke Center for STEM Learning on its flagship Taylorsville Redwood Campus. SLCC made room for the 6,000 square-foot, two-story Center by renovating part of its Science and Industry Building. 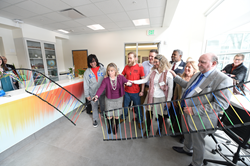 SLCC President Deneece G. Huftalin explained to onlookers about the colorful, long homemade DNA sequence she was about to cut to officially mark the Center’s opening. “When you’re starting a STEM learning center, you can’t just have a ribbon,” Huftalin said. She noted how the new space embraces learning and engagement and showcases a “community” approach to STEM education. “I’m so anxious to come in here on a Monday morning and listen to the energy that’s being created in the room by the students who are trying to figure out different problems in science, math and engineering,” she added. It’s anticipated that the Center will receive about 10,000 visits per spring and fall semesters for students seeking free tutoring and advising or areas for studying, workshops and collaboration. Thirty-three percent ($397,139) of the construction project was funded with federal money from the Department of Education and 67% ($802,861) by non-governmental sources. SLCC plans to expand the Center with a third level for hosting seminars and STEM professionals and expanded services for students. A major donation to fund construction of the Center came from the Katherine W. Dumke and Ezekiel R. Dumke, Jr. Foundation. Dumke board member Scott Thornton was on hand for the opening. “I can’t believe how well utilized every nook and cranny is,” Thornton said. “I think it’s going to be really exciting to see how the students use this space going forward.” Additional funding from private sources included the George S. and Dolores Dore Eccles Foundation, the Sorenson Legacy Foundation and Jeff Nelson. SLCC student Davies Young speaks to a crowd at the opening of the Dumke Center for STEM Learning.